Mold infestations can spread quickly through homes and businesses in Houston, Pasadena, and Cypress, especially after a water damage emergency. Property owners should take mold seriously, as this fungus can damage homes and businesses. Mold spores can also endanger your health if you inhale them as they travel through the air. A Houston mold removal company can help you beat back a mold infestation quickly and effectively. The mold remediation techs at 911 Restoration of Houston have the training and experience to handle commercial and residential mold infestations so you can get your peace of mind back. We understand that finding mold in your property can be shocking and that you might not know what to do next. Note that some forms of mold can be hazardous to your health and they should not be cleaned without professional protective gear. A mold inspection can identify the type of mold you are dealing with. 911 Restoration of Houston can handle all of your mold cleanup needs. We have the equipment and the experience to successfully resolve large and small mold infestations throughout Houston, Pasadena, and Cypress. Count on a mold removal company with years of experience to return your property to the perfect condition you deserve after you experience a mold infestation. Mold can spread quickly once it gains a foothold in your home or business. You may be wondering how you developed a mold infestation in the first place. Many times, mold begins to grow after property owners experience a water damage emergency, like a flooded basement or a burst pipe. Excess moisture gives mold the perfect place to grow. You can reduce the odds that you’ll face a mold infestation by contacting a water damage restoration company immediately after a flood, sewage backup, or pipe burst emergency. Getting water out of your property and completing the dehumidification process can leave mold without anywhere to go. Mold can thrive even in small spots of moisture, often growing behind walls or under floors, where you can’t spot it. Make sure that you contact a Houston mold removal company immediately if you suspect that you have a mold problem. A professional mold cleanup tech can assess the extent of your issue with a mold inspection in Houston. Determining exactly what you’re dealing with can make the mold remediation process easier. Get help handling all aspects of mold decontamination, including odor removal, by contacting 911 Restoration of Houston right now. You can rely on us to offer you the same-day mold cleanup services you need. We can also handle any water damage to your property in Houston, Pasadena, and Cypress. 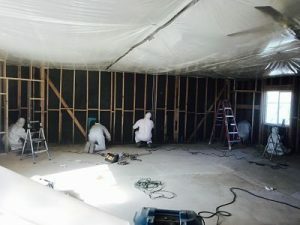 As a full-service Houston mold remediation company, 911 Restoration of Houston can do whatever it takes to totally restore your home or business. No one wants to find mold growing in their home or business. Fortunately, you can get help resolving the issue quickly by contacting 911 Restoration of Houston. Our crews are on-call 24/7/365, so you can get the help you need when you need it the most. Our techs are IICRC certified to take care of both commercial and residential mold remediation in Houston. Years of experience prepared us to take on all kinds of mold, including toxic black mold cleanup. You can rely on us to thoroughly handle mold decontamination in Houston. We understand the importance of correctly handling all aspects of mold removal. Let us start by identifying the extent of the infestation with a mold inspection. Techs can send a sample of your mold to a 3rd party laboratory for identification. You can also count on us to handle any underlying issues that led to the mold infestation in the first place. Let us check for a leaking pipe or damp spots in your home or business. Techs can repair water damage to your property while removing all traces of moisture. You can get back your peace of mind with a Fresh Start from 911 Restoration of Houston. 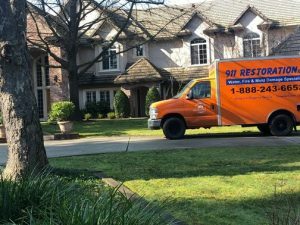 Let our mold removal techs return your property to the pristine condition you remember after you discover mold in Houston, Pasadena, or Cypress.